It is easy to see parental pride and maternal love. 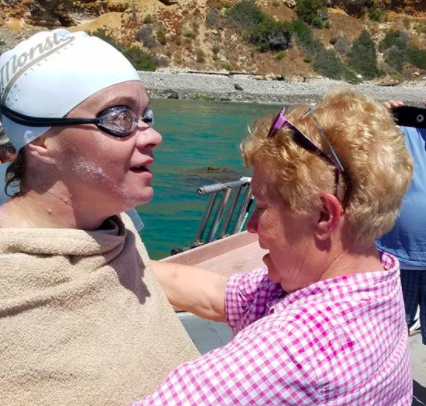 And Julie Newton made her mother, on board the Bottom Scratcher across the Catalina Channel, very proud with her 13 hour 35 minute crossing of the 20.2-mile channel in Southern California. After setting the women's record at the 15 km Clean Half Extreme Marathon Swim in Hong Kong, the 34-year-old Singapore resident was well-prepared for a successful crossing under the auspices of the Catalina Channel Swimming Federation.